Our coaching Certifications are accredited and issued by Strategic Learning Alliance and Wainwright Global Institute. Dr. Jacquie Hood Martin is a Certified Master Coach and authorized provider, and pleased to have her own Balanced Living Coach Certification recognized by this internationally renowned platform. Contact us today, http://jacquiehood.com/contact/ for more information or to have your specific questions answered about scheduling and payments. Dr. Jacquie Hood Martin offers on-going certifications online, face-to-face, and by tele-conference. Register for your life changing, financial enhancing certification today! Company group plans, individual plans, entrepreneurship, and non-profit rate plans are available ranging from $695 – $2495 (based on individual or group) and includes a license to use content for coaching your own clients, in addition to the required 2-year membership with SLA (Strategic Learning Alliance); and a bundle of professional assessments to use with your company and clients. Certifications can be earned together or separate. 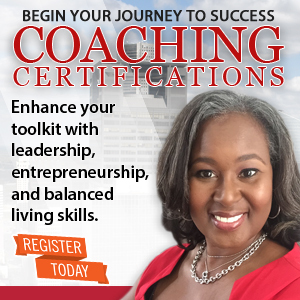 Adding a niche coaching certification such as a Balanced Living Coach to your existing coaching certifications, is a value add to your leadership and entrepreneurship endeavors. 2 half days 1 full day – Our live online weekend course is offered in four – and – eight hour sessions allowing students to complete their training in one weekend; or Saturday – Sunday. Course homework is to be completed on Saturday evening. Portfolio submission to Strategic Learning Alliance is to be completed of the online course. Customized days for groups or individuals is an option. Monday through Thursday – Both morning and evening courses are offered in four, 4-hour sessions which allows students to complete their training in four days. Course homework is assigned Tuesday and is due on Wednesday. Portfolio submission to Strategic Learning Alliance is to be completed within 30 days of the online course. Customized days for groups or individuals is an option. Customize your session to meet your work-life-balance goals of earning your Certification. 2 Year Membership in Strategic Learning Alliance Applied-Learning Professional Community and more! Contact us today, using the form below or by visiting http://jacquiehood.com/contact/ for more information or to have your specific questions answered about scheduling and payments.